Your dream smile is just around the corner! At Dr. Ted Filandrianos & Associates, we offer cosmetic solutions to rejuvenate your smile. Whether you are looking to restore a damaged tooth or wanting to close unwanted gaps between teeth, we are here to help. With every treatment plan, our goal is to improve the beauty and function of your smile. Contact our Newton dental office to find out more about our cosmetic services! Zoom uses a unique lamp to activate the bleaching gel placed on your teeth to help you achieve a noticeably brighter looking smile in just one session. We also offer Zoom touch up pens to help patients maintain their smile while at home. 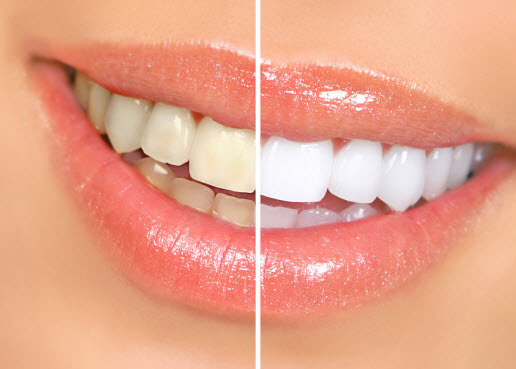 What Are the Steps Involved with Zoom® Teeth Whitening? After the teeth are left exposed one of our dentists or dental assistance will apply the whitening gel, which works in sync with the Zoom light. The light helps the gel penetrate your enamel to break down the stains that have built up over time. After we apply the teeth whitening gel to your teeth, it will stay on your teeth for 15-minute sessions. We may use up to four of these sessions to achieve the best result. How Much Will It Cost to Whiten My Teeth? To better understand your cost of treatment our staff will help you understand your insurance benefits so that you can budget any out-of-pocket expense. As with most dental procedures, it is essential to keep in mind that results will be different for each patient. Our expert team will perform an oral exam and discuss all your options to determine if teeth whitening is for you. Some patients may experience varying degrees of tooth sensitivity during the zoom whitening process. In some cases, patients may feel a minor tingling immediately after the whitening procedure is complete that will gradually decrease over time. It is always our goal to keep patients comfortable during any treatment. If you have any anxieties about the whitening process, please share them with us during your consultation. The in-office whitening process usually takes about an hour; however, we do also recommend you have a regular tooth cleaning before any whitening treatment. Any cosmetic procedure you need should be done after whitening so you can choose a lighter shade for your crown, veneer, or dental implant. The smile you are born with might not be the smile of your dreams. Your teeth may have grown in or shifted in a manner that caused misalignment of your teeth. To prevent any further damage or extensive treatment your teeth should be brought back to proper alignment. Dr. Ted Filandrianos & Associates is here to improve your smile by correcting some of the most common alignment issues. To evaluate which option is right for you, we will perform an oral exam to assess the alignment or any other problems you may have. Once the exam is over, we can then recommend the best fit option. Crooked, crowded, and unevenly spaced teeth may alter your natural bite. These cause a variety of dental issues, such as wear and tear, increased risk of periodontal disease, and the need for more costly dental care. While Invisalign can restore your natural smile, it also can help prevent future oral health concerns. Invisalign is a clear removable aligner which slowly but surely straightens your teeth. This process works by wearing a series of the aligners until your teeth are where they should be. With Invisalign, we eliminate the need for wires, brackets, and the usual restrictions that come with standard metal braces. Using a set of clear brackets and wires that match the color of your teeth, Six Month Smiles can correct most misalignment problems in about six months. Find out if you qualify for the expedited orthodontic treatment. 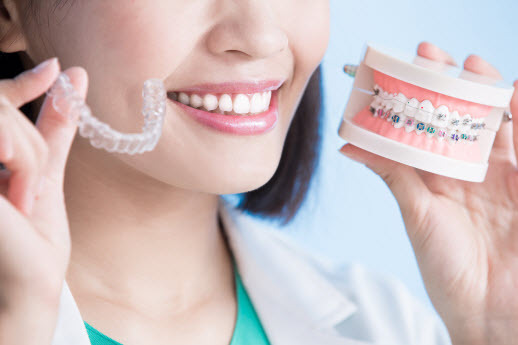 How do traditional braces compare to Invisalign? Invisalign consists of a clear, and virtually invisible retainer. It can address most of the same orthodontic issues as traditional braces without the usual discomfort. For braces, the typical process consists of aligning your teeth with wires, and brackets that are attached to your teeth with dental cement. Invisalign is free of all these constraints by offering you a removable aligner. Veneers are a great way to correct minor tooth imperfections that are naturally occurring or have happened over time. Alignment and spacing – overtime your teeth may become misaligned or form gaps; veneers can cover these gaps and misalignment. Misshaped teeth – Veneers can hide chips, worn teeth, fractures, and small or oddly shaped. Color – The food and drinks you eat can cause your teeth to become discolored; Teeth colored shells can hide this. How Are My Veneers Applied? We will perform an initial consultation to asses which teeth the veneers will go on. Your veneers are then designed to fit you in an aesthetically pleasing manner, while still looking like your natural smile. To get a feel of what your veneers may look like a temporary veneer may be used. Veneers are an excellent option if your teeth have any cosmetic issues you are looking to fix. They are efficient at concealing chips, stains, misaligned teeth, and much more. In some cases, veneers may not be a viable option for you. Veneers are usually applied to the front teeth only, because constant chewing may damage or misaligned. It is important to note the color of the veneers will match the current shade of your smile. Before the procedure, we do recommend getting your teeth whitened. Whether you are looking for a way to improve an aesthetic issue or the dentist has recommended it, a crown of porcelain might be the right choice for you. Our dentists use tooth-colored porcelain to design crowns that mirror the shape, color, and functionality of your natural teeth. If your tooths aesthetic is very mild, we may recommend dental bonding. If you have a single tooth chipped, cracked, or discolored, the dentist may recommend dental bonding. The dentist forms a putty-like material on the tooth to restore its appearance and function, which hardens and completes the tooth. Bonding may also be used to remedy some cosmetic issues such as gaps in your teeth. Missing teeth may cause gaps to form, that can take away from your beautiful smile. Dr. Ted Filandrianos & Associates offer various implants to help restore your smile to what it once was. Bridges: A permanent dental appliance that is a great way to replace a few missing teeth, bridges consist of a combination of acrylic, metal, and porcelain which are the most common types of materials used to match your existing smile. A bridge tends to consist of multiple teeth and is anchored down to two adjacent teeth. Dentures: A permanent prosthetic dental implant designed to replace an entire arch of missing teeth in either the upper jaw, lower jaw, or sometimes both. Dentures may take some to get used to, however, in time they will begin to feel like your natural teeth. With constant advancements in dental implants, dentures are becoming more natural looking and comfortable than they have ever been. Partials: Partial dentures a removable, and natural looking implant. Partials help replace one or multiple missing teeth, restoring the function and shape of your jaw to what it once was. Partial dentures consist of a combination of gum colored acrylic base and a metal framework that holds It in place within your mouth. To further understand what cosmetic option might be for you, contact our office and schedule a consultation today!